Handmade paper is not unique to India. While handmade paper produced in other parts of the world uses mainly fresh cotton lintel, Indian handmade paper is made by using cotton rag waste from the garment industry. Garment plants generate tonnes of cotton rag waste every month. Under ordinary circumstances, this waste is deposited into landfills causing environmental damage. As a result of recycling all the cotton rags into handmade paper, less waste is generated for the environment. It is not just recycling. Handmade paper produced in India also uses many discarded plant fibres from cotton to banana. Normally, these waste materials add to the already severe waste problems we have in India. Up cycling manages this problem very well. Up cycling is also a great way to create employment. Separating and streamlining the fibres requires the employment of people from catchment areas and villages. 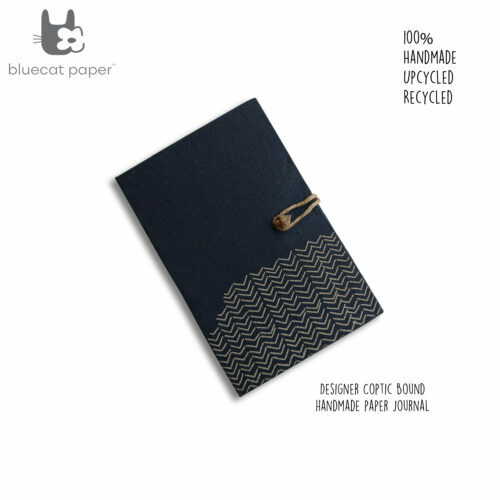 Since it is made entirely from recycled and up-cycled materials, handmade paper is entirely wood-free. This makes it the most eco-friendly form of paper around. During the manufacturing of white paper, a large number of chemicals are used to render the paper smooth texture and white colour. In contrast, no toxic chemicals are used in the handmade paper making process. A small quantity of rosin soap and/or alum is added to the pulp to make the writing paper blot-free. Handmade paper makes use of pollution-free methods in the making process. The sheets are sun-dried, thus conserving traditional forms of energy usage. Handmade paper seems to be a gift to nature when it comes to eco-friendliness! No trees are cut, no energy is wasted and only natural materials are used. Therefore handmade paper reduces pollution, saves natural resources, and contributes to a much healthier and more sustainable ecosystem. In addition, it’s classy and beautiful too!